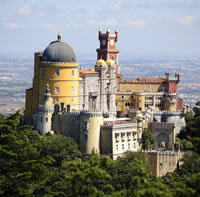 Sintra has borne witness to nearly all periods in Portuguese history. More than this, Sintra is a treasure trove of vestiges of the history of Humanity itself. From the Palaeolithic and Neolithic to the Bronze and Iron Ages , followed by the Roman Moorish occupations, and from the foundation of Portugal (on 9 January 1154, King D. Afonso Henriques granted a charter to the town of Sintra) to the Discoveries, Sintra - which survived the 1755 earthquake - experienced its own golden age during the late 18th and throughout the 19th century. This period marked the start of the rediscovery of the magic of Sintra, whose oldest medieval form Suntria denoted the Indo-European luminous star or sun. It was also called the Holy Mountain and Mountains of the Moon. It was in the third quarter of the 18th century that the Romantic spirit of the foreign travellers and the Portuguese aristocracy exulted in the magic of Sintra and its environs, as well as the exoticism of its landscape and climate. William Beckford came here in the summer of 1787, as the guest of the fifth Marquis of Marialva, Chief Equerry of the Kingdom, and resided in his Seteais property. At the beginning of the 19th century, the (then) Princess D. Carlota Joaquina, wife of the Regent D. João, bought the Ramalhão Estate and Palace. Between 1791 and 1793, Gerard Devisme built the neo-Gothic mansion on his extensive Montserrate estate. It was also the exoticism of this landscape, wrapped in mist for a large part of the year, which attracted another Englishman, Francis Cook, the second tenant of Montserrate after Beckford, who paid for the construction of the oriental-style pavilion that we know today. He was one of a series of foreign grandees who took up residence here in palaces, mansions and chalets, which they built or rebuilt in keeping with the possibilities offered by the unusual natural surroundings. This extraordinary development of the Sintra landscape reached its peak in the reign of D. Fernando II of the dynasty of Saxe-Coburg-Gotha (1836-1885). Very much associated with Sintra and its landscape, which he held in great affection, this artist-king established Romanticism here with a splendour that is unique in the Mediterranean regions. The king acquired the Pena Convent, situated on a steep mountain, and transformed it into a fabulous magic palace, giving it the enormous size that only a romantic with great artistic vision and aesthetic sensitivity could dream of. It anticipates, so to speak, the famous castle of Neuchwanstein, built by Ludwig II of Bavaria. D. Ferdinand II also surrounded the palace with a vast romantic park planted with rare exotic trees, decorated with fountains, watercourses and chains of ponds, chalets, chapels and false ruins, and traversed by magic paths unrivalled anywhere else. The king also took care to restore the forests of the Serra (mountains): thousands of trees were planted, mainly indigenous oaks and stone pines, Mexican cypresses, acacias from Australia and countless other species that made an outstanding contribution to the romantic character of the Serra. 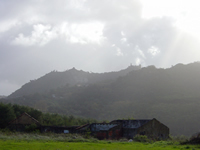 The Serra de Sintra (Sintra mountains) thus became an eminently precious and unusual cultural landscape. In terms of nature, Mediterranean and northern flora were combined with hundreds of exotic trees and flowers in a truly unique setting of gardens, parks and forests. 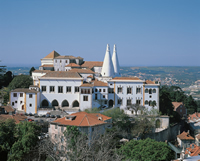 During the second half of the 19th century and the early decades of the 20th, Sintra became a favourite place for artists: musicians such as Viana da Motta; musician-painters like Alfredo Keil; painters like Cristino da Silva (who produced one of Portuguese Romanticisms most famous works, Cinco Artistas em Sintra (Five Artists in Sintra ); and writers like Eça de Queiróz and Ramalho Ortigão, who all lived, worked or sought their inspiration here. Many other artists were seduced by Sintra. Sintra was transformed in art - written, painted, sung and recollected by Byron, Christian Andersen, Richard Strauss e William Burnett, among others. Historical and architectural circumstances dictated for Sintra and its Serra (mountains) a unique individuality that was not confined to the Royal Palace of Pena. Quite the contrary, it oscillated between theory and the promotion of the construction of a romantic landscape in the form of archetypes that poured out into the vast array of revivalist architecture, continuing well into the 20th century. Sintra is no ordinary town, wrote the art historian Vítor Serrão in 1989. Sintra is a World Heritage Site and a Cultural Landscape (classified by UNESCO). Sintra is a parallel universe that we only know from dreams but which exists very near us. In short, Sintra is the true and unique capital of Romanticism.  Sintra is the only place in the country in which History has become a garden, because all its legends converge there and its very monuments speak less of the past than of an eternal present of greenery. The memory even of tragedy vanishes in the air or grows green again in the ivy of an ancient wall. In Sintra one does not die  one passes alive to the other side, because death is impossible in the vigour of beauty. And the memory of what has passed remains in it to give succour. 'Louvar Amar' (To Praise, To Love), Vergílio Ferreira.